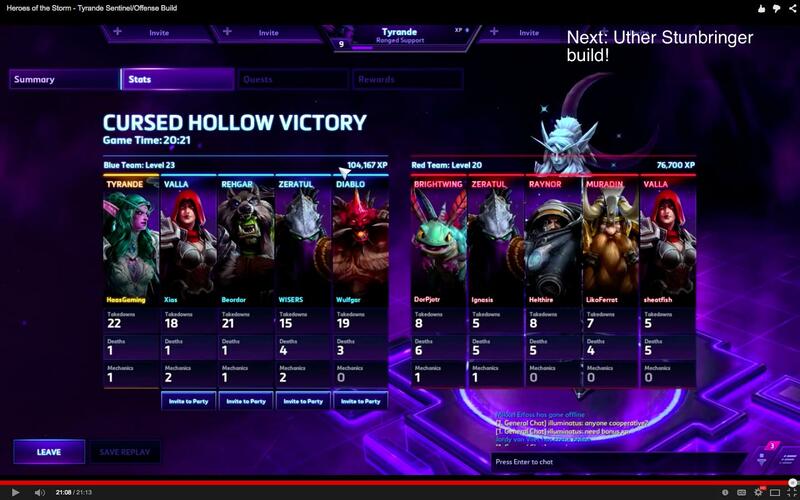 What are Mechanics numbers in the end of game table of Heroes of the storm? Also, how are Takedowns count? Do you need to deal certain amount of damage to a dead enemy? or heal someone who killed it? or just be near? how near? The Takedown stat is the combination of player kills and assists (support abilities, being close by, or dealing any damage). Blackheart's Bay - How many doubloon you have turned in. Cursed Hollow - How many tributes you have collected. Dragon Shire - How many times you have unleashed dragon. Garden of Terror - How many seeds you have gathered. Haunted Mines - How many skulls you have gathered. Takesdowns function similar to how lane minions give experience. As long as you're nearby or a part of the kill directly, you get the point for it. This should also carry across the mechanic that if you were a part of the kill in some way within the last 5 seconds, you will get the point as well. This would be healing, damaging, or things like Tyrande's Shadowstalk since it is buffing the ally that got the kill. As for mechanics, these are directly related to the map mechanics themselves and has nothing to do with player encounters. The numbers, for the most part, aren't good indicators of how well you did mechanically, but more-so is the quantitative values earned for your team. You'd get these for things like picking up seeds for the Garden Terror, turning in doubloons (+1 per doubloon), gathering skulls in the mines, etc. If I remember right, merc camps don't reward any points towards this.